The 4-star Hotel Andrea in Mayrhofen in the Ziller Valley is only a few minutes' walk from both cable cars, the main road and the bus stops. Guests can relax in a spa area. The spa area at the Andrea Hotel includes a Finnish sauna, a steam bath, a sun bed, and a relaxation room with panoramic views of the Zillertal Alps. In the morning a rich breakfast buffet awaits you, featuring a cereal corner and sparkling wine on Sundays. Guests on a half-board arrangement are served a 4-course meal with a choice of dishes between 18:00 and 21:00. The on-site Mt. Everest Restaurant offers à la carte dishes (closed in November). Pamper yourself with a visit to the spa, which offers massages. A spa tub and a sauna offer a relaxing way to wind down after a day on the slopes. This hotel also features complimentary wireless Internet access, an arcade/game room, and ski storage. The complimentary ski shuttle makes getting to the slopes a breeze. This family-run hotel garni is located in a quiet side street in the centre of Mayrhofen, opposite the Zillertal-Congress Europahaus. The non-smoking Hotel Maria Theresia offers spacious rooms with cable TV and balconies. In the morning, a rich breakfast buffet with hot and cold dishes is available, while in the evening, refined wines are served in the Take Off bar. Hotel Maria Theresia features a sauna and a steam bath. Chiropractic treatments are available on site. The sauna and the steam bath are available free of charge from beginning of November to beginning of April. There is also an underground car park, which has limited space. A sun terrace, and a spacious garden with a sunbathing lawn are also provided. An internet terminal with WiFi can be found in the lobby of the Maria Theresia. Only a 3-minute walk away from the train station and the bus stops, Hotel Glockenstuhl enjoys a quiet location in the centre of Mayrhofen. Parking is available free of charge. The Glockenstuhl’s spa area features a Finnish sauna, a bio sauna, a steam bath, an infrared cabin, massage showers, and a relaxation room. All rooms have a balcony, cable TV, and a bathroom with a hairdryer. Hotel Garni Glockenstuhl has a winter garden with a tiled stove, a fireplace lounge, a bar, and a large garden with a terrace. Bicycles are provided for guests’ use free of charge (subject to availability). Guests of the Glockenstuhl enjoy free admission to Mayrhofen’s public outdoor pool, and free 3-hours entrance to the public indoor pool, daily from May until November. 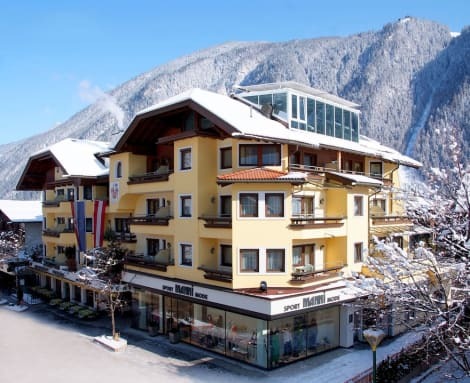 This traditional 4-star hotel is only a 5-minute walk away from the centre of Mayrhofen, and a 10-minute walk from the cable cars. A ski bus stop is right outside. The spacious rooms at Hotel Rose have a flat-screen cable TV, a safe, and a bathroom. The Rose Hotel's spa area includes a Finnish and a steam sauna, a Kneipp basin, and a hot tub. There is also a gym and a table tennis room. In the morning a rich breakfast buffet is served. In the evening the restaurant offers various themed evenings, such as a farmers’ buffet, an Italian buffet, or an elegant gala dinner. The garden has a big sunbathing lawn and a covered garden terrace with live music in summer. Free private parking is available on site. An underground car park is available at an additional cost. Set in the Ziller Valley, a 10-minute walk from Mayrhofen's town centre, Alpin-Hotel Schrofenblick offers cosy Tyrolean-style rooms with cable TV, a spa centre and free bicycle rental. Guests can relax in the lush garden and sample Austrian cuisine in the restaurant, accompanied by wines from the wine cellar. The menu includes homemade strudels, sweets, soups and salads which can be served on the terrace or in the garden. The Alpin-Hotel is a good starting point to explore the Ziller Valley with opportunities to go mountain biking, hiking and paragliding in summer and skiing and snowboarding in winter. There are 2 cable car stations which take guests to 2,000 metres above sea level, with 200 km of walking routes and climbing opportunities. A highlight for all nature enthusiasts is the 372 km² big nature reserve Hochgebirgspark Zillertaler Alpen. This charming hotel is located in the Upper Zillertal and in the heart of Tyrol. 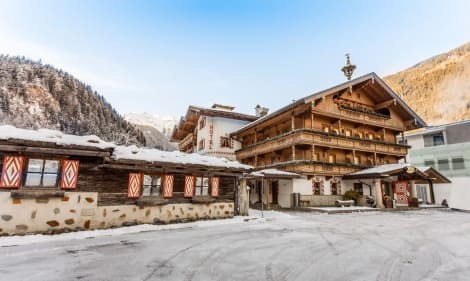 Along with the villages of Brandberg, Ginzling, Ramsau and Schwendau, the Upper Zillertal offers an extensive range of attractions for a fantastic winter holiday or an unforgettable summer break. In winter, the Vans Penken Park, one of the largest snowboard parks in Europe, offers irresistible challenges for snowboarders and freestyle snowboarding. The train station is 100 m away and the closest ski resort is just 500 m from the accommodation. At this 250-room hotel, the hosts' hospitality is reflected in the establishment's warm atmosphere. Guests will enjoy the hotel's bar and TV lounge. Lift access also features. All of the rooms are en suite (bath/shower), and come equipped with a hairdryer, direct dial telephone, satellite TV, radio, safe and minibar. Most rooms also feature a balcony, and a tiled stove. There is one indoor and one outdoor pool on site and guests will enjoy relaxing in the hot tub, steam room or sauna after a day on the piste. There is also a sun terrace and massage treatments can be provided. For more sporty types, table tennis and tennis are offered, as well as bowling or mini golf. Trips into the surrounding countryside can also be undertaken on horseback. This establishment aims for genuine enjoyment, where food is not only a passion, but a way of life. Ingredients are used that not only make life worth living, but also really sweeten it. Pamper yourself with a visit to the spa, which offers massages, body treatments, and facials. If you're looking for recreational opportunities, you'll find an outdoor pool, an indoor pool, and a sauna. Additional amenities at this Art Deco hotel include complimentary wireless Internet access, ski storage, and shopping on site. You'll be on the slopes in no time with the complimentary ski shuttle. lastminute.com has a fantastic range of hotels in Mayrhofen, with everything from cheap hotels to luxurious five star accommodation available. We like to live up to our last minute name so remember you can book any one of our excellent Mayrhofen hotels up until midnight and stay the same night.